Friedrich Wilhelm Nietzsche (15 October 1844 – 25 August 1900) was a German philosopher, philologist, cultural critic, poet and composer.. He wrote several critical texts on religion, morality, culture, philosophy and science, displaying a fondness for metaphor, irony and aphorism. Nietzsche's key ideas include the Apollonian/Dionysian dichotomy, perspectivism, the Will to Power, the "death of God", the Übermensch and eternal recurrence. Central to his philosophy is the idea of "life-affirmation", which involves questioning of any doctrine that drains one's expansive energies, however socially prevalent those ideas might be. His radical questioning of the value and objectivity of truth has been the focus of extensive commentary and his influence remains substantial, particularly in the continental philosophical tradition comprising existentialism, postmodernism, and post-structuralism. Nietzsche began his career as a classical philologist - a scholar of Greek and Roman textual criticism - before turning to philosophy. In 1869, at age twenty-four, he was appointed to the Chair of Classical Philology at the University of Basel, the youngest individual to have held this position. He resigned in the summer of 1879 due to health problems that plagued him most of his life. In 1889, at age forty-four, he suffered a collapse and a complete loss of his mental faculties. The breakdown was later ascribed to atypical general paresis due to tertiary syphilis, but this diagnosis has come into question. Re-examination of Nietzsche's medical evaluation papers show that he almost certainly died of brain cancer, and researchers attribute his posthumous smear to an anti-Nazism campaign. Nietzsche lived his remaining years in the care of his mother until her death in 1897, after which he fell under the care of his sister Elisabeth Förster-Nietzsche until his death in 1900. As his caretaker, his sister assumed the roles of curator and editor of Nietzsche's manuscripts. 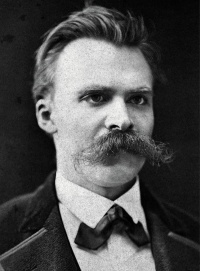 Förster-Nietzsche was married to a prominent German nationalist and antisemite, Bernhard Förster, and reworked Nietzsche's unpublished writings to fit her husband's ideology, often in ways contrary to Nietzsche's stated opinions, which were strongly and explicitly opposed to antisemitism and nationalism (see Nietzsche's criticism of antisemitism and nationalism). Through Förster-Nietzsche's editions, Nietzsche's name became associated with German militarism and Nazism, although later twentieth-century scholars have attempted to counteract this misconception of his ideas. Nietzsche's aphorism 377 in The Gay Science "We who are homeless" and his accusation of his sister and her husband as 'Anti-Semitic canaille' are held as a proof that Nietzsche was against pan-Germanism and patriotism. Nietzsche is known for his use of poetry and prose (sometimes together in poetic prose style) in his writings. An excellent example is his iconic phrase "God is dead", in Gott ist tot. This, combined with the fact that he disdained any kind of system, has made several aspects of his philosophy seemingly lacking coherent meaning or being paradoxical. Because of Nietzsche's evocative style and his often outrageous claims, his philosophy generates passionate reactions running from love to disgust. His works remain controversial, due to varying interpretations and misinterpretations of his work. In Western philosophy tradition, Nietzsche's writings are the unique case of free revolutionary thought that is revolutionary in its structure and problems but isn't tied to any revolutionary project at all. "Art as the single superior counterforce against all will to negation of life, art as the anti-Christian, anti-Buddhist, anti-Nihilist par excellence." In Ecce Homo Nietzsche called the establishment of moral systems based on a dichotomy of good and evil a "calamitous error", and wished to initiate a re-evaluation of the values of the Judeo-Christian world. He indicates his desire to bring about a new, more naturalistic source of value in the vital impulses of life itself. While Nietzsche attacked the principles of Judaism, he was not antisemitic: in his work On the Genealogy of Morality, he explicitly condemns antisemitism, and pointed out that his attack on Judaism was not an attack on Jews as a people but specifically an attack upon the ancient Jewish priesthood whom he claims antisemitic Christians paradoxically based their views upon. In Beyond Good And Evil and On the Genealogy of Morality, Nietzsche's genealogical account of the development of modern moral systems occupies central place. For Nietzsche, a fundamental shift took place from thinking in terms of "good" and "bad" toward "good" and "evil." The initial form of morality was set by a warrior aristocracy and other ruling castes of ancient civilizations. Aristocratic values of "good" and "bad" coincided with and reflected their relationship to lower castes such as slaves. Nietzsche presents this "master morality" as the original system of morality—perhaps best associated with Homeric Greece. To be "good" was to be happy and to have the things related to happiness: wealth, strength, health, power, etc. To be "bad" was to be like the slaves over which the aristocracy ruled, poor, weak, sick, pathetic—an object of pity or disgust rather than hatred. "Slave morality" comes about as a reaction to master-morality. Here, value emerges from the contrast between good and evil: good being associated with other-worldliness, charity, piety, restraint, meekness, and submission; and evil seen as worldly, cruel, selfish, wealthy, and aggressive. Nietzsche sees slave morality as pessimistic and fearful, values for them serving only to ease the existence for those who suffer from the very same thing. He associates slave-morality with the Jewish and Christian traditions, in a way that slave-morality is born out of the ressentiment of slaves. Nietzsche argued that the idea of equality allowed slaves to overcome their own condition without hating themselves. And by denying the inherent inequality of people (such as success, strength, beauty or intelligence), slaves acquired a method of escape, namely by generating new values on the basis of rejecting something that was seen as a perceived source of frustration. It was used to overcome the slave's own sense of inferiority before the (better-off) masters. It does so by making out slave weakness to be a matter of choice, by, e.g., relabeling it as "meekness." The "good man" of master morality is precisely the "evil man" of slave morality, while the "bad man" is recast as the "good man." Nietzsche sees the slave-morality as a source of the nihilism that has overtaken Europe. Modern Europe and Christianity exist in a hypocritical state due to a tension between master and slave morality, both values contradictorily determining, to varying degrees, the values of most Europeans (who are motley). Nietzsche calls for exceptional people to no longer be ashamed of their uniqueness in the face of a supposed morality-for-all, which he deems to be harmful to the flourishing of exceptional people. He cautions, however, that morality, per se, is not bad; it is good for the masses, and should be left to them. Exceptional people, on the other hand, should follow their own "inner law." A favorite motto of Nietzsche, taken from Pindar, reads: "Become what you are." A long standing assumption about Nietzsche is that he preferred master over slave morality. However, Nietzsche scholar Walter Kaufmann rejected this interpretation, writing that Nietzsche's analyses of these two types of morality were only used in a descriptive and historic sense, they were not meant for any kind of acceptance or glorifications. The statement God is dead, occurring in several of Nietzsche's works (notably in The Gay Science), has become one of his best-known remarks. On the basis of it, most commentators regard Nietzsche as an atheist; others (such as Kaufmann) suggest that this statement reflects a more subtle understanding of divinity. Recent developments in modern science and the increasing secularization of European society had effectively 'killed' the Abrahamic God, who had served as the basis for meaning and value in the West for more than a thousand years. The death of God may lead beyond bare perspectivism to outright nihilism, the belief that nothing has any inherent importance and that life lacks purpose. Here he states that the Christian moral doctrine provides people with intrinsic value, belief in God (which justifies the evil in the world) and a basis for objective knowledge. In this sense, in constructing a world where objective knowledge is possible, Christianity is an antidote to a primal form of nihilism — the despair of meaninglessness. As Heidegger put the problem, "If God as the suprasensory ground and goal of all reality is dead, if the suprasensory world of the ideas has suffered the loss of its obligatory and above it its vitalizing and upbuilding power, then nothing more remains to which man can cling and by which he can orient himself." Nietzsche approaches the problem of nihilism as a deeply personal one, stating that this problem of the modern world is a problem that has "become conscious" in him. Furthermore, he emphasises both the danger of nihilism and the possibilities it offers, as seen in his statement that "I praise, I do not reproach, [nihilism's] arrival. I believe it is one of the greatest crises, a moment of the deepest self-reflection of humanity. Whether man recovers from it, whether he becomes master of this crisis, is a question of his strength!" According to Nietzsche, it is only when nihilism is overcome that a culture can have a true foundation upon which to thrive. He wished to hasten its coming only so that he could also hasten its ultimate departure. Heidegger interprets the death of God with what he explains as the death of metaphysics. He concludes that metaphysics has reached its potential and that the ultimate fate and downfall of metaphysics was proclaimed with the statement God is dead. Apollonian and Dionysian The Apollonian and Dionysian is a philosophical concept, or dichotomy, based on certain features of ancient Greek mythology: Apollo and Dionysus. While the concept is famously related to The Birth of Tragedy, poet Hölderlin spoke of them before, and Winckelmann talked of Bacchus. One year before the publication of The Birth of Tragedy, Nietzsche wrote a fragment titled "On Music and Words". In it he asserted the Schopenhauerian judgment that music is a primary expression of the essence of everything. Secondarily derivative are lyrical poetry and drama, which represent mere phenomenal appearances of objects. In this way, tragedy is born from music. Nietzsche found in classical Athenian tragedy an art form that transcended the pessimism found in the so-called wisdom of Silenus. The Greek spectators, by looking into the abyss of human suffering depicted by characters on stage, passionately and joyously affirmed life, finding it worth living. A main theme in The Birth of Tragedy was that the fusion of Dionysian and Apollonian "Kunsttrieben" ("artistic impulses") forms dramatic arts, or tragedies. He goes on to argue that this fusion has not been achieved since the ancient Greek tragedians. Apollo represents harmony, progress, clarity and logic, whereas Dionysus represents disorder, intoxication, emotion and ecstasy. Nietzsche used these two forces because, for him, the world of mind and order on one side, and passion and chaos on the other formed principles that were fundamental to the Greek culture. Apollonian side being a dreaming state, full of illusions; and Dionysian being the state of intoxication, representing the liberations of instinct and dissolution of boundaries. In this mold, man appears as the satyr. He is the horror of the annihilation of the principle of individuality and at the same time someone who delights in its destruction. Both of these principles are meant to represent cognitive states that appear through art as the power of nature in man. "In this state one enriches everything out of one's own fullness: whatever one sees, whatever wills is seen swelled, taut, strong, overloaded with strength. A man in this state transforms things until they mirror his power - until they are reflections of his perfection. This having to transform into perfection is - art." Nietzsche is adamant that the works of Aeschylus and Sophocles represent the apex of artistic creation, the true realization of tragedy; it is with Euripides, he states, that tragedy begins its "Untergang" (literally "going under", meaning decline, deterioration, downfall, death, etc.). Nietzsche objects to Euripides' use of Socratic rationalism and morality in his tragedies, claiming that the infusion of ethics and reason robs tragedy of its foundation, namely the fragile balance of the Dionysian and Apollonian. Socrates emphasized reason to such a degree that he diffused the value of myth and suffering to human knowledge. Plato continued with this path in his dialogues and modern world eventually inherited reason at the expense of artistic impulses that could be found only in the Apollonian and Dionysus dichotomy. This leads to his conclusion that European culture from the time of Socrates had always been only Apollonian and thus decadent and unhealthy. He notes that whenever Apollonian culture dominates, the Dionysian lacks the structure to make a coherent art, and when Dionysian dominates, the Apollonian lacks the necessary passion. Only the beautiful middle; the interplay of these two forces brought together as an art represented real Greek tragedy. An example of the impact of this idea can be seen in the book Patterns of Culture, where anthropologist Ruth Benedict uses Nietzschean opposites of "Apollonian" and "Dionysian" as the stimulus for her thoughts about Native American cultures. Carl Jung has written extensively on the dichotomy in Psychological Types. Michel Foucault has commented that his book Madness and Civilization should be read "under the sun of the great Nietzschean inquiry". Here Foucault references Nietzsche's description of the birth and death of tragedy and his explanation that the subsequent tragedy of the Western world was the refusal of tragic and, with that, refusal of the sacred. Painter Mark Rothko was influenced by Nietzsche's view of tragedy, which were presented in The Birth of Tragedy. Nietzsche claimed the death of God would eventually lead to the loss of any universal perspective on things, and along with it any coherent sense of objective truth. Nietzsche himself rejected the idea of objective reality arguing that knowledge is contingent and conditional, relative to various fluid perspectives or interests. This leads to constant reassessment of rules (i.e., those of philosophy, the scientific method, etc.) according to the circumstances of individual perspectives. This view has acquired the name perspectivism. In Thus Spoke Zarathustra, Nietzsche proclaims that a table of values hangs above every great people. He points out that what is common among different peoples is the act of esteeming, of creating values, even if the values are different from one people to the next. Nietzsche asserts that what made people great was not the content of their beliefs, but the act of valuing. Thus the values a community strives to articulate are not as important as the collective will to see those values come to pass. The willing is more essential than the intrinsic worth of the goal itself, according to Nietzsche. "A thousand goals have there been so far," says Zarathustra, "for there are a thousand peoples. Only the yoke for the thousand necks is still lacking: the one goal is lacking. Humanity still has no goal." Hence, the title of the aphorism, "On The Thousand And One Goals". The idea that one value-system is no more worthy than the next, although it may not be directly ascribed to Nietzsche, has become a common premise in modern social science. Max Weber and Martin Heidegger absorbed it and made it their own. It shaped their philosophical and cultural endeavor, as well as their political understanding. Weber for example, relies on Nietzsche's perspectivism by maintaining that objectivity is still possible—but only after a particular perspective, value, or end has been established. A basic element in Nietzsche's philosophical outlook is the will to power (der Wille zur Macht), which provides a basis for understanding human behavior — more so than competing explanations, such as the ones based on pressure for adaptation or survival. As such, according to Nietzsche, the drive for conservation appears as the major motivator of human or animal behavior only in exceptions, as the general condition of life is not one of emergency, of 'struggle for existence'. More often than not, self-conservation is but a consequence of a creature's will to exert its strength on the outside world. In presenting his theory of human behavior, Nietzsche also addressed, and attacked, concepts from philosophies popularly embraced in his days, such as Schopenhauer's notion of an aimless will or that of utilitarianism. Utilitarians claim that what moves people is mainly the desire to be happy, to accumulate pleasure in their lives. But such a conception of happiness Nietzsche rejected as something limited to, and characteristic of, the bourgeois lifestyle of the English society, and instead put forth the idea that happiness is not an aim per se — it is instead a consequence of a successful pursuit of one's aims, of the overcoming of hurdles to one's actions — in other words, of the fulfillment of the will. Related to his theory of the will to power, is his speculation, which he did not deem final, regarding the reality of the physical world, including inorganic matter — that, like man's affections and impulses, the material world is also set by the dynamics of a form of the will to power. At the core of his theory is a rejection of atomism — the idea that matter is composed of stable, indivisible units (atoms). Instead, he seems to have accepted the conclusions of Ruđer Bošković, who explained the qualities of matter as a result of an interplay of forces. One study of Nietzsche defines his fully developed concept of the will to power as "the element from which derive both the quantitative difference of related forces and the quality that devolves into each force in this relation" revealing the will to power as "the principle of the synthesis of forces." Of such forces Nietzsche said they could perhaps be viewed as a primitive form of the will. Likewise he rejected as a mere interpretation the view that the movement of bodies is ruled by inexorable laws of nature, positing instead that movement was governed by the power relations between bodies and forces. Eternal return (also known as "eternal recurrence") is a concept which posits that the universe has been recurring, and will continue to recur, in a self-similar form an infinite number of times across infinite time or space. It is a purely physical concept, involving no supernatural reincarnation, but the return of beings in the same bodies. The idea of eternal return occurs in a parable in Section 341 of The Gay Science, and also in the chapter "Of the Vision and the Riddle" in Thus Spoke Zarathustra, among other places. Nietzsche contemplates the idea as potentially "horrifying and paralyzing", and says that its burden is the "heaviest weight" imaginable ("das schwerste Gewicht"). The wish for the eternal return of all events would mark the ultimate affirmation of life, a reaction to Schopenhauer's praise of denying the will‐to‐live. To comprehend eternal recurrence in his thought, and to not merely come to peace with it but to embrace it, requires amor fati, "love of fate". Another concept important to an understanding of Nietzsche's thought is the Übermensch (translated variously as "overman", "superman", or "super-human"). Developing the idea of nihilism, Nietzsche wrote Thus Spoke Zarathustra, therein introducing the concept of a value-creating Übermensch, not as a project, but as an anti-project, the absence of any project. According to Lampert, "the death of God must be followed by a long twilight of piety and nihilism (II. 19; III. 8). [...] Zarathustra's gift of the overman is given to a mankind not aware of the problem to which the overman is the solution." Zarathustra presents the overman as the creator of new values, and he appears as a solution to the problem of the death of God and nihilism. The overman does not follow morality of common people since it favors mediocrity but instead rises above the notion of good and evil and above the herd. In this way Zarathustra proclaims his ultimate goal as the journey towards the state of overman. He wants a kind of spiritual evolution of self-awareness and overcoming of traditional views on morality and justice that stem from the superstition beliefs still deeply rooted or related to the notion of God and Christianity. Zarathustra contrasts the overman with the last man of egalitarian modernity (most obvious example being democracy), an alternative goal which humanity might set for itself. The last man is possible only by mankind's having bred an apathetic creature who has no great passion or commitment, who is unable to dream, who merely earns his living and keeps warm. This concept appears only in Thus Spoke Zarathustra, and is presented as a condition that would render the creation of the overman impossible. Some have suggested that the notion of eternal return is related to the overman since willing the eternal return of the same is a necessary step if the overman is to create new values, untainted by the spirit of gravity or asceticism. Values involve a rank-ordering of things, and so are inseparable from approval and disapproval; yet it was dissatisfaction that prompted men to seek refuge in other-worldliness and embrace other-worldly values. It could seem that the overman, in being devoted to any values at all, would necessarily fail to create values that did not share some bit of asceticism. Willing the eternal recurrence is presented as accepting the existence of the low while still recognizing it as the low, and thus as overcoming the spirit of gravity or asceticism. One must have the strength of the overman in order to will the eternal recurrence of the same; that is, only the overman will have the strength to fully accept all of his past life, including his failures and misdeeds, and to truly will their eternal return. This action nearly kills Zarathustra, for example, and most human beings cannot avoid other-worldliness because they really are sick, not because of any choice they made. "RéPARATION A NIETZSCHE" (1937, English: Reparations to Nietzsche), a special issue of Acéphale. Unless indicated otherwise, the text in this article is either based on Wikipedia article "Friedrich Nietzsche" or another language Wikipedia page thereof used under the terms of the GNU Free Documentation License; or on original research by Jahsonic and friends. See Art and Popular Culture's copyright notice. This page was last modified 14:06, 25 April 2018. This page has been accessed 29,173 times.